Many of today's companies span multiple countries and languages. In today's global market it is more important than ever to communicate results to clients in a manner that is clear, concise and fully understandable. It is for these reasons that Lakes Environmental has introduced language selection in ISC-AERMOD View. Now whether in North America, Europe or Asia, both modelers and clients can benefit from a multi-lingual interface where languages can be selected and applied to the software in real-time. No closing the software, no rebooting, no hassle. ISC-AERMOD View features powerful 3D visualization tools. Unlike other software that requires you to purchase yet another software package just so you can view plain, static 3D plots, ISC-AERMOD View provides powerful, dynamic 3D tools built right into its interface. Giving you total control, you can zoom in and rotate your site and modeling results in true 3-Dimensional space. This allows you to view your model from any perspective and further investigate what is influencing your model results ! The Multiple Chemicals Run utility will drastically boost your productivity if you have sources emitting multiple pollutants and you wish to model the contributions from each pollutant. For example, a number of stacks are emitting pollutant made up of Chemical A, Chemical B, and Chemical C. Traditionally, to determine the contribution of each of these components you would run the model once for each component. The problem with the traditional approach is if you are modeling 20 different pollutants, your run time would be equivalent to running the model 20 times. The Multiple Chemicals Run utility allows you to bypass this step and calculate the contribution from each component quickly and concisely. All you need to do is define the pollutants you are modeling, specify which pollutants are being emitted by each source, and click run! The Multiple Chemical Runs Utility takes care of the rest, reducing your model run time to a fraction of the time it would take traditionally. Getting your modeling project done on time and in budget requires you to have full-featured tools at your disposal. That's why the full-featured AERMET View is included with ISC-AERMOD View. Since AERMET View is not a limited version of EPA's AERMET preprocessor you are not forced to purchase expensive met data from a vendor. You can process raw meteorological data, which is freely available for many sites on the Internet. Met data is essential to any air dispersion modeling project, and so is having the right tools on hand at all times. The full-featured Rammet View, included with ISC-AERMOD View, has the tools to get any met data ready for use with the ISCST3 and ISC-PRIME models! Modeling requirements differ from project to project and you shouldn't need to hand define receptors. ISC-AERMOD View provides extensive receptor input options. All receptors support the import of terrain elevations from digital terrain data files and can also be manually edited if necessary. ISC-AERMOD View takes the hassle out of performing modeling runs that require percentiles or rolling averages. Fully integrated options inside the interface allow you to run the model and have these calculations automatically computed. The ISC-AERMOD Batcher is designed to let you easily perform multiple modeling runs. Simply specify the input files for the projects you wish to run, click Run and ISC-AERMOD Batcher will run all your projects! This is ideal for large modeling runs, (i.e., as often required for risk assessments). Simply set up your batch runs for the night and your modeling is done for your in the morning! Buildings can radically influence air dispersion modeling, and ISC-AERMOD View gives you all the tools you need to effectively and quickly complete your building downwash analysis. ISC-AERMOD View supports a wide variety of digital elevation terrain data formats so you can quickly define the terrain elevations for your modeling project. Save time and avoid costly hand-made errors! All the tools you need for 3D Visualization of your site terrain are included with ISC-AERMOD View! ISC-AERMOD View allows you to import existing ISCST3, ISC-PRIME & AERMOD input files. This fast import allows you to instantly visualize and review any project. This option is ideal for regulators who wish to quickly review submitted projects. It also gives you the ability to view previously generated projects and quickly update them if necessary. More and more professionals have been switching to ISC-AERMOD View, and this option also allows you to easily import modeling projects produced by other interfaces or generated by the standard EPA DOS models. Clear communication of your modeling and results are crucial to a successful project. ISC-AERMOD View lets you impress with integrated report generation. 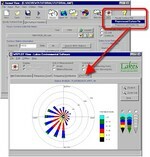 Lakes popular wind rose software, WRPLOT View, is integrated with ISC-AERMOD View, allowing to quickly get wind rose plots and frequency analyses with a single click. With thousands of registrations every year, WRPLOT View is the most popular wind rose package available on the Internet. Advanced contouring tools are part of the ISC-AERMOD View package. There is no need to purchase an additional software package to produce professional, customized contoured results of your modeling. Below are just a a few of the features you will find in the integrated contouring tools. ISC-AERMOD View features graphical tools allowing you to rapidly create your model while generating dynamic visualization at the same time. All project objects (i.e. receptors, sources, etc.) can also be defined in text mode, which is a spreadsheet environment. Visualizing your site in ISC-AERMOD View is easy. Our full-featured support for a variety of image and map formats allow you to design your model with confidence and view your results in context with your site. California's AB 2588 Phase II risk assessments often make use of the ACE2588 risk assessment model. To ease the pain of the file creation requirements of this model, ISC-AERMOD View contains some tools which streamline the process. Today's leading Risk Assessment Protocols have specific modeling requirements. Only ISC-AERMOD View removes the hassle from generating the required model runs. See why more of today's leading professionals choose ISC-AERMOD View!.